The HERO Workplace Health and Well-Being (HWB) Awards honor dedication and commitment to the field, and acknowledge outstanding achievements in the practice of HWB in the areas of Leadership and Research. Honorees are asked to share their experiences in HWB with their peers at the HERO Forum during the awards presentation. The 2018 HERO Forum on From the C-Suite to the Shop Floor: Well-Being for All was held October 1-4, 2018, at the Sawgrass Marriott Resort & Spa in Ponte Vedra Beach, FL. 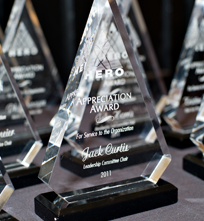 Each year, HERO pays tribute to individuals in the field of health and well-being with our HERO HWB Awards. The HERO HWB Awards honor leaders in five categories. Nomination forms are reviewed by HERO. Eligible candidates may be asked to provide additional information. All nominations are reviewed by the HERO Awards Committee. Award winners are notified by June 28, 2019. Winners are required to accept their award in person at HERO Forum. Applicants who do not win remain eligible for consideration in the following calendar year. Workplace Health & Well-being (HWB): A set of organized activities and systematic interventions, offered through corporations/worksites, managed care organizations, and governmental/community agencies, whose primary purposes are to provide health education, identify modifiable health risks, and influence health behavior changes. Healthy Workplace: HERO acknowledges that currently many tools exist to measure the existence of a healthy workplace. The HERO HWB Awards will accept the HERO Scorecard, the National Business Group on Health’s Wellness Impact Scorecard, WELCOA’s Well Workplace Survey, or the Organizational Risk Assessment by HealthScan Solutions as credible tools for this assessment. Leadership Position: An elected, appointed or earned role in a recognized organization or committee affiliated with a recognized organization. Organization contributing to or affiliated with advancement of HWB: Employers that have offered and promoted a robust suite of prevention-oriented health management services for more than five years; providers of prevention-oriented health management solutions for the workplace and beyond; consulting firms that specialize in the design, facilitation, and/or delivery of prevention-oriented health management solutions. When does the application process for 2019 open? When and how are awards distributed? Award winners are asked to accept their award in person at the HERO Forum. The awards are presented through the course of the Forum. Are there company size requirements? HERO would like to thank the efforts of the HERO Awards Committee. As the co-founder and former CEO of HERO, Bill (and HERO) issued a loud Wake Up Call for America that our nation was in the midst of a perfect storm of poor health, an aging population and rising health care costs. Bill spent years bringing together leaders in the HWB industry: employers, researchers, providers, payors and consultants and insisting that together, we represented a powerful force with the ability to positively impact the health of our nation. Today, HERO’s membership and its voice and power as an agent for change have more than doubled. The Bill Whitmer Leadership Award is shaped by and honors the decades of hard work and vision in the field of health and well-being (HWB) by Bill Whitmer. Mark Dundon contributed to the advancement of health and well-being (HWB) for the decades he spent working in the healthcare industry. 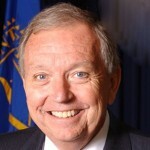 Best known within the ranks of the HERO membership as the co-founder and former Chairman of the Board of HERO, Mark’s contributions to the field of HWB research and the healthcare field include running a three state health care system in Kentucky, and providing the seed money for ground-breaking research. Each year at the HERO Forum, The Mark Dundon Research Award is presented to the professional who most closely embodies his outstanding work in the area of HWB research. As HERO advances its journey as a premier HWB resource organization, it is important to recognize the corporate leaders who make the meaningful execution of HWB possible. This award is presented annually to a person of senior leadership status (CEO, CFO, VP) who has made an outstanding contribution towards the advancement of HWB within their company. We wish to recognize individuals who have been largely responsible for the success of their company program through professional dedication and a personal commitment to creating a culture of health. HERO recognizes health and wellness practitioners that have directly impacted the health of their organization and the associated outcomes. This award will be presented to a person directly involved in the day to day operations of health and well-being (Wellness Directors, Health Managers, Human Resource) who has made an outstanding contribution towards the advancement of HWB within their company. HERO is building on a long-standing awards tradition by establishing a national awards program to recognize individuals who are actively engaged in their own well-being through participation in a company-sponsored health and well-being program, have achieved and maintained their health goals for at least two years and who may also be providing leadership as a volunteer wellness champion for their organization. The Healthy HERO Award Program enables sponsoring organizations to highlight the successes of individuals who participate in their health and well-being program.